What deodorant do you wear if you have sensitive skin? Some high street anti-perspirants can be too harsh and irritate dry or sensitive skin, especially if you have eczema but there are quite a few natural alternatives out there. Even if you don’t have sensitive skin there are many arguments against smothering your armpits with chemicals just to stop you sweating. Perspiration is just the natural way that the body secretes toxins and if we stop that from happening is this really good for any us? Remember also that over 60% of what you put onto your skin is absorbed into your body so think carefully what you choose to apply to your sensitive underarm area. We also shave and wax the hairs from our underarms (why do we do this?) which then means anti-perspirants can further block up those pores with man-made chemicals and all to keep us smelling of roses all day long and looking hair free. Noone wants to smell, I get that, but fresh body odour can be quite a turn on, aherm. I strongly believe that these natural alternatives work just as good, if not better, because they don’t block pores and contain natural ingredients. Try them! I hope you’ll be suprised and treat your pits with a bit more respect in future! This is what I’m using at the moment and I’m honestly speechless about how good it is. Not that I sweat that much anyway, or course not, I’m a lady, I merely perspire gently. Seriously though, it’s natural, contains no fragrance, parabens, nothing nasty at all and is so easy to use. Simply apply to wet skin after you wash, bathe or shower or wet the crystal and apply to dry skin. I don’t notice any body odour – please do tell me if you know me, if I do smell and have simply got used to my own BO… I seem to sweat less and the only down side is that it does sting when applied to just shaved skin, but then what deodorant doesn’t? Mine is like a stick and came in a dispenser that you push up from the bottom to use and the only thing you should do is make sure you store it on a soap dish as it can stain surfaces and can drip water out of the bottom if it gets wet. I think this is similar to the small crystal below but is in a handy dispenser. It costs around £5.95 so a bit pricey but it lasts for ages and ages, much longer than normal deodorant so should end up costing a similar amount. Natural Volcanic Alum Stone works as a deodorant by leaving a fine salty, slightly alkaline film on the skin, inhibiting the growth of microbes. It keeps the skin fresh and deodorised all day. No microbes equals no odour. Natural alum allows perspiration, one of the body’s cleansing and interpersonal communication mechanisms, keeps the pores free, and does not stain clothing. The molecules are large and are not absorbed into the skin, plus the molecules have a negative charge, also keeping natural alum from entering the skin. I can’t explain how this stuff works but it does. You will need a little soap dish to keep it on as it can stain surfaces. Great for travelling as it’s so small and light and it’s just so simple. Straight out of the show and you roll the crystal over wet skin. 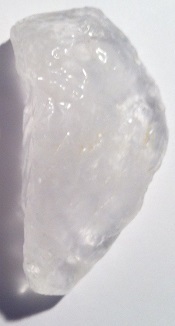 This costs about £5 per cystal block. I bought this one online from Natural Spa Supplies. This comes as a roll-on deodorant or a stick deodorant if you prefer and is suitable for even the most sensitive of skin. The Japanese spa minerals gently deodorise without preventing perspiration. It also neutralises bacteria responsible for the bad odours and does work, to a point. I did find that this product was great for every day use but for sport when you sweat more, it didn’t really stop body odour – however one usually showers after sport anyway so this never really caused me any issues. This deodorant has been specifically designed for young teenage skins. Containing natural ingredients, it also provides effective all-day protection by inhibiting the growth of bacteria, the cause of body odour, whilst still allowing the skin to breathe. 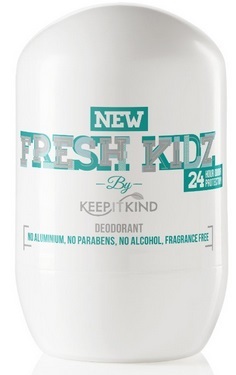 You should be able to buy Keep It Kind Fresh Kidz Fragrance Free Roll On Deodorant 50ml in Tesco, Boots and on Amazon online. Honestly this home-made deodorant is so easy and all you need is coconut oil, shea butter, (both 100% ethically sourced of course) bicarbonate of soda, arrowroot powder and your chosen favourite essential oils. Special thanks to Wellness Mama for this delicous natural deodorant recipe – almost good enough to eat! There are loads of companies selling natural cystal salt deodorants so you could also check out Jason, Faith in Nature, Salt of the Earth and Weleda, though I haven’t tried these deodorants myself. So have you ever thought about what deodorant or anti-perspirant you use? Are you using a natural one? Keep it natural and try some of these organic, paraben free, fragrance free, all natural deodorants.